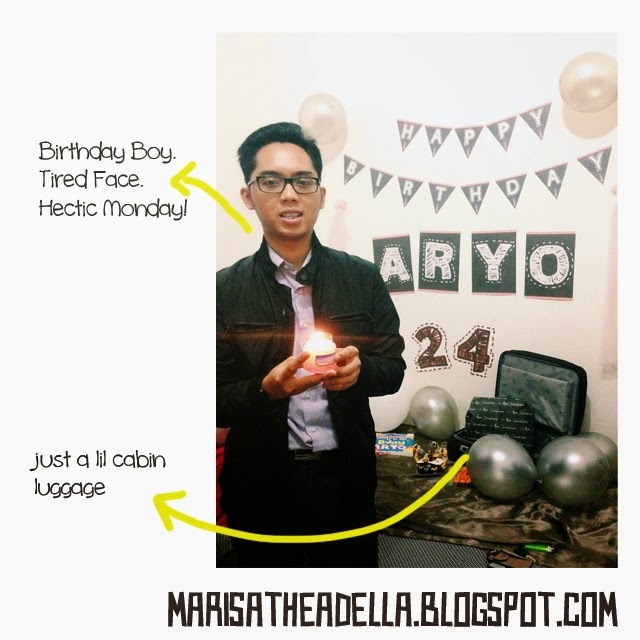 Marisa Thea Della: Happy Birthday Baby-Bro! November is such a hectic month for me- there are so many green-marks on my schedule (green means birthday!) and most of them are very close to me. It starts with my sister-in-law's birthday on November 6th, then my very best friend, Aji, on November 8th, then my cute nephew, Khairu, on November 12th, then my beloved boyfriend, Aryo, on November 17th and three more of my friends'. See!? 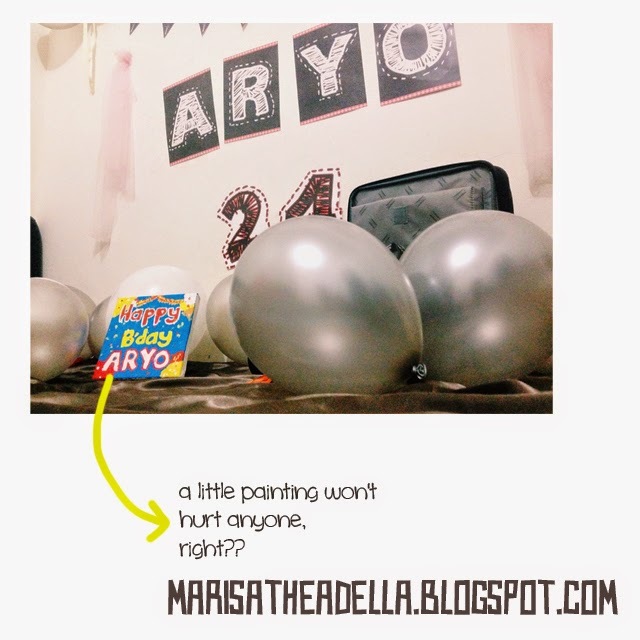 Yesterday was Aryo's 24 birthday. I wanted to throw a birthday surprise for him on this coming Saturday- since we rarely meet during weekdays, but on last Sunday night, he told me that we 'might' meet just to celebrate his birthday. So then, I was like... Geez, what should I do?! 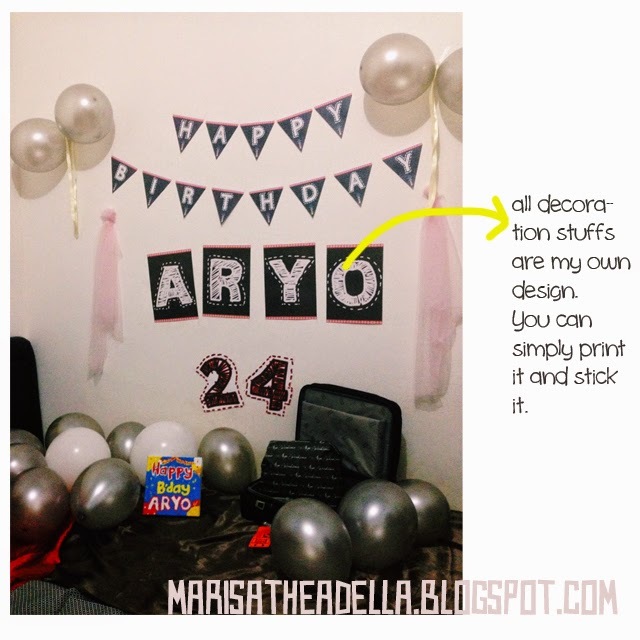 Luckily, I have printed some birthday stuffs for him before. So then I thought I just need to make some more and print it early in the morning. And the plan went well. I printed some more birthday decorations early in the morning at Star Printing (or Star something, I forgot the name.) around Benhil area. They open 24/7 and close to my office- and cheap. Their receptionist and cashier are nice, but it's 'nah' for the operators. To be honest, I was not really sure whether I'll make it or not. I got back home at around 7.30pm and he told me that he'll come soon. So I started to cut everything and stick it in full speed. I pumped the balloons by myself- thank god I have the pump-thingy. And everything went well... before I realized that I don't have the birthday cake. Dang you, brain! I was about to buy the cake when he told me that he is on the way. I bought him a sport bag because he likes to go to gym and to play soccer with his friends. 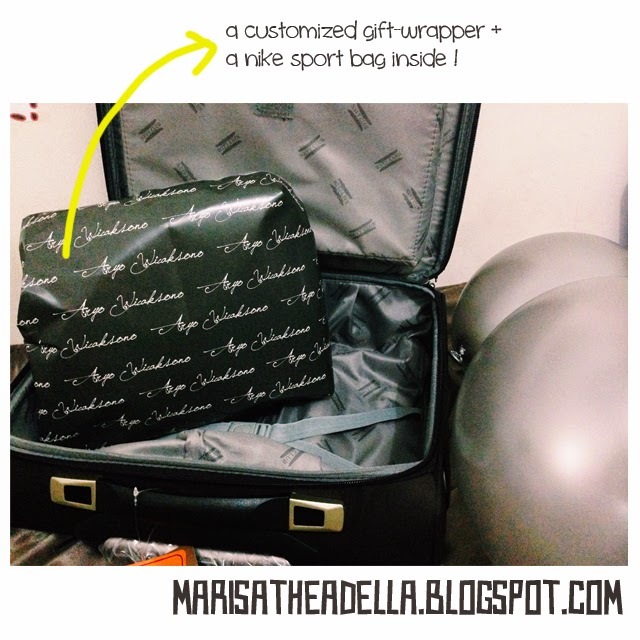 I chose a black-neon green Nike bag that I forgot to capture and wrapped it with a customized gift-wrapper (you can see his name on the wrapper). For addition, I also bought a cabin luggage since sometime he needs to go out of Jakarta for several days. Those are the decorations that I told you before. I designed them by myself and printed it. It took less than 15minutes to print everything. I used Art Paper 150grams for the paper. The happy-bday painting is my own painting- sorry if it's ugly. The canvas is 20 by 20 cm and the paints are acrylic. I bought the canvas at Toko Gunung Agung, Senayan City. The fabrics belong to me- yes I do have a lot of fabrics! 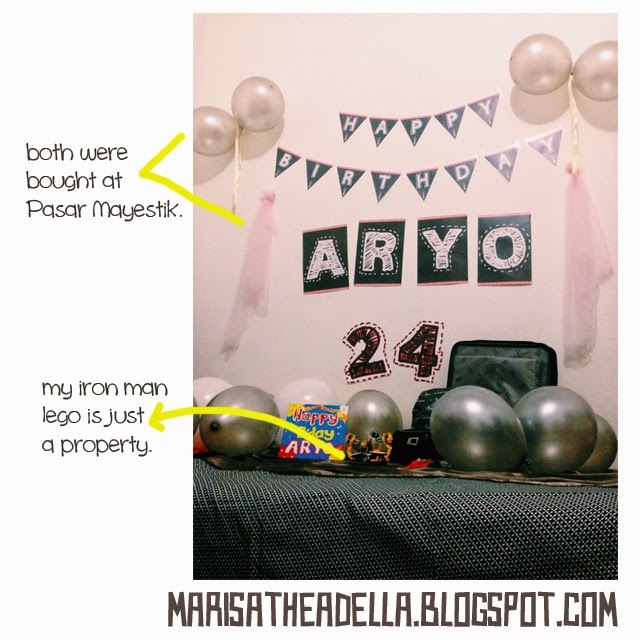 I bought the balloons at Pasar Mayestik. It costs me 40K to get 50pcs of the balloons and 20K to get the pump. You can actually ask someone to pump it, they are available around Kemang area, but since I didn't have any time so I just pumped it by myself. The Iron Man Lego is just a property tho- I know he likes Marvel, but I love it more. So here is my birthday boy with his tired face. The candle was not a cake- it was actually my aromatherapy candle. Haha. Well, I am so happy to know that he liked it. Once again, happy birthday my big baby, I wish nothing but the best for you!